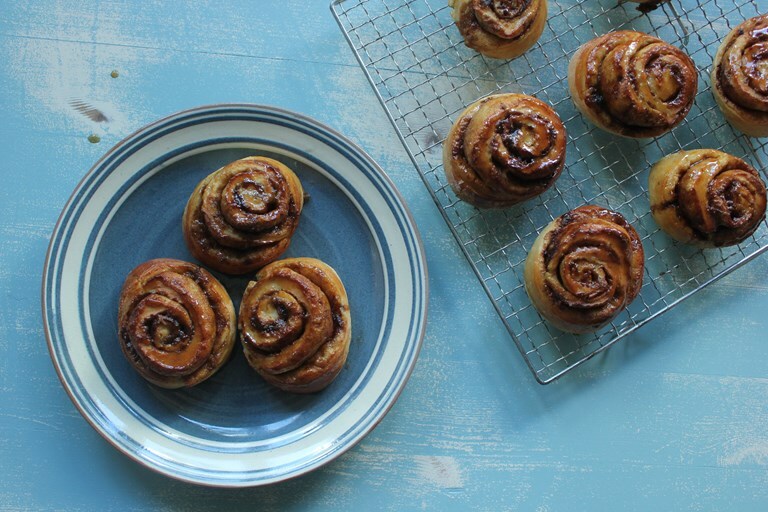 Sticky and delicious, especially served warm from the oven, Chloë's recipe for cinnamon buns is inspired by the traditional Nordic dish. A popular treat in Finland and Sweden, there are however regional differences in the exact recipe that Chloë experiments with to find the perfect combination. If I ever see another cinnamon bun again, it will be too soon. Not because they aren’t one of the most delicious teatime treats ever invented, or because this recipe given to me by my Swedish-Finnish friend Petra Lovelock of Nordic Kitchen isn’t foolproof. No, it’s because I had to make about eight batches in order to work out how to get the darned things to rise up beautifully in the oven like little gluttonous versions of Tatlin’s Tower. Petra says the Finnish and Swedish buns are more-or-less identical. The biggest difference is the method traditionally used to shape the dough. The Fins prefer to roll the dough, then cut diagonally across the top to make neat little trapezoids that, when baked, create flat-topped rolls that burst with spirals of cinnamon sugar on either side. The Swedish cut the dough into rounds and bake them spiral-up, producing a visual effect not unlike that of a Chelsea bun. For seven batches I attempted to recreate Petra’s favoured Finnish version, but to no avail: I hadn’t the knack. Although every batch was moreish, they kept exploding in the oven. To my clumsy British hand, the Swedish method held out, although I am kicking myself for not rolling the dough short side to short side on attempt number two. Perhaps I would have had earlier success had I not been wielding a yard-long sausage of dough each time. Petra’s mother and grandmother taught her this recipe. Cinnamon buns are cooked throughout Scandinavia, and, as I learn from watching Better Call Saul, are so popular there is a global bakery brand named in their honour. I’m told the quantity of butter used here is just a guide; the women in Petra’s family would use only as much as they have to hand. The recipe has been slightly amended by me. I reduced the quantity of ground cardamom in the dough, partly to my taste, but largely due to the scarcity of this ingredient in British stores. I have also been a bit more specific with the quantity of cinnamon and sugar scattered before the second rise. The trick is to keep it airy: avoid over-handling the dough or adding too much flour, it seems using scalded milk also produces a lighter result. The basic mix is essentially an enriched brioche that works beautifully for doughnuts, or plaited to form a sweet challah-style loaf. It seems I may not even have to see a cinnamon bun again, in order to enjoy their warm, homely flavour.